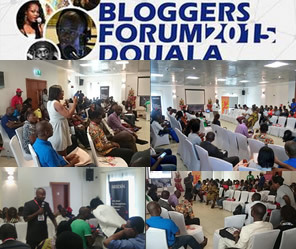 It was a beautiful experience on the 3rd of October 2015 at Star Land hotel in Douala, with over 150 bloggers, company executives and journalists. Simply put, blogging is being reloaded in Cameroon! This was the first bloggers forum in Cameroon that brought together both French and English speaking Cameroonian bloggers residing in Cameroon. For my friends and loyal readers who are all over the world, Cameroon is one of the few bilingual countries in the world where French and English are official languages. The event was colorful and I want to recognize the effort of Elodie and her collaborators in making this a remarkable success. Of course, some of the corporate sponsors and partners of the event were Les Brasseries du Cameroun, Nexttel, Nescafe and Star Land Hotel. At one point of the event, it became a Journalists vs Bloggers debate. While that almost drifted us off the core and raison d’être of the event, it was quickly mastered . Journalists use blogging as a business tool. In other words, they use blogging as a tool to aid their business of journalism. The act of blogging is not journalism and can never be. Blogging is a channel any one in any industry can use to market content. Blogging, Writing and journalism, though have overlapping features, they are different industries. I was one of the panelists and my contribution was on how to create a blog and monetize it while in Cameroon. A lot of people thought (before the event) that this was not a possibility. However, sharing my story and experiences brought in some smiles and excitement. In the weeks ahead, there shall be a workshop focused on making money as a blogger in Cameroon. If you are reading this post in Cameroon, interested in generating income blogging, stay tuned. I shall be giving more info on this. We shall get into details how to start and create that money making blog. Blogging is the reason I fired my boss. Let me know what you think about this event in Cameroon. Drop your comments (in French or English) in the comment box and share on social media. Congrats Man! You’re doing a good job. Carry On. Good luck with the next Cameroon blogging workshop. Will you be videoing it? Hey Joy, thanks for adding your voice and giving beauty to this post. Yeah it was a wow moment when I got up. Many were shocked to hear some figures I mentioned about my blog. Wow, great write up. Nice to see the event through another eye. I was inspired by your presentation. I will definitely be at the workshop. Hope to see you again there for all the money blogging teaching skills. I’m very sure that it was a very fun event and i have no doubt that you really overfed them :). je savais pas que tu comprenais aussi le francais, cela fais plus de 3 mois que je lis regulierement tes publications, je les apprecie enormement. Pour nous les africains, il nous est tellement difficile de monetiser nos blogs. Moi je suis precisement au Congo – RDC, j’ai un tech-blog qui a environ 5k page vues par jour mais je gagne presque rien avec. Comment ça se pass au Congo? Oui c’st difficile mais tres possible. Pendant le workshop que j’organize, je vais traiter en détails comment monetiser etant au Cameroun. Tres possible! Mais mon frere! 5k page views? That can translate to real money. What about unique visitors? Pour le moment, j’arrive à 2600 visiteurs unique par jour, je suis impatient d’apprendre encore plus sur comment monetiser son blog grace au Workshop que vous organisez. Good to see you spreading the word about blogging in your country. I’m sure you gave an awesome contribution with your monetization experience. Keep up the gtreat work! Hurray for Cameroun!, Hurray for Blogging. I see from the pictures that the event went well and smoothly. Blogging is growing at a quick rate and it is nice to know that you are making a difference by revealing the secrets to making money with a blog. Congratulations and I know you sure made an impact in bloggers forum. Love the photos you have shared here. I could only imagine how people there were amazed when you spoke about monetizing your blog. Fantastic!!! Donna Merrill recently posted…Are Your Subscribers Responsive To You? That’s great that this event happened and congrats on being one of the panelist. I’m sure your story gave them a positive and different perspective in leveraging a blog to make money. I see it was a great turn out and hopefully the blogosphere will keep growing in Cameroon! Hopefully, it will grow to greater heights. the field is still very unexploited. That meetup actually shows the universal potential of blogging and it is making its inroads everywhere in the world. I too belong to a comparatively a less developed country and here also people are talking about to be in connect with offline with industry players and learn more with offline interactions. As you know very well online is the one aspect of life and the bigger aspect is offline which we can’t ignore until the whole world in all its commercial and creative activities goes online. Since then both online and offline interactions are required to make a venture big success. Thanks a lot for sharing this lovely post. I’m glad you get the point. As bloggers, we must go offline and do events that contribute to the industry. Online is not enough. The more of these events, the more online grows. Great post to demarcate the areas of journalist versus blogging versus activism. These three are entirely different domain and your post makes it clear as day ! It’s so good to see you blazing the trail man, many people believe that Making Money from Blogging is impossible or downright difficult from Africa, but people like you have proven them wrong. I can’t wait to see where all this will take you to. Dan Ewah recently posted…Should I just blog on Facebook?